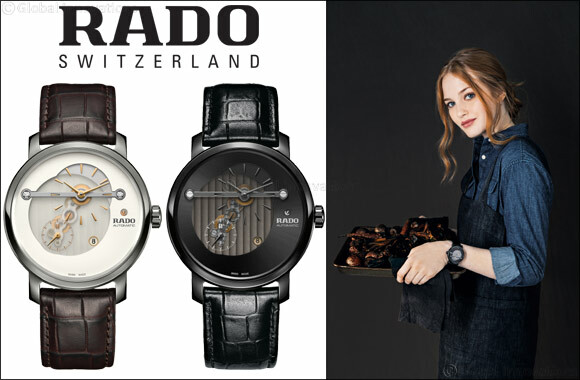 Dubai, UAE, April 9, 2018: The new Rado DiaMaster models showcase Rado’s bold approach to design and how the brand succeeds in daring to be different. With pared-down details, and large, open and readable dials, the DiaMaster has proudly represented Rado’s minimal side – until now. With traditional C�tes de Gen�ve detailing on the movement visible through the transparent dial and the exposed gear trains from the movement also on display, there is a lot to take in at first glance but just as much to hold your interest in the years to come. Making the most of the unusual arrangement of the movement with small second at seven o’clock and the hours and minutes dominating the upper half of the dial, the Rado designers have also brought in an additional design element in the form of a bar reminiscent of a horizon, bridging the transparent divide of the dial from left to right.